QuickCAM Systems is pleased to announce the release of a new package of kitchen design software and production software, focused on the manufacturer with CNC capability. This fully integrated package provides the most advanced automation methods to run your operation from Sales Lead Generation to Kitchen Design and on to the CNC. 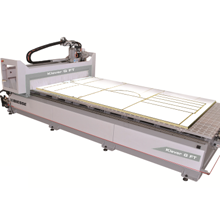 This is Screen to Machine like you have never seen before and incorporates all the best time-saving features currently available to the high volume manufacturers. This package is designed to help you sell, manufacture and win in this tough and competitive market. Once a kitchen manufacturer acquires it’s first CNC it is assumed that the company has reached the heady heights of automation where the company’s production costs will be reduced to a level where profit is at its maximum, which means the company is in the fast lane and everything will start getting easier….. Really? It is a fact that a CNC is a major step towards automation and lowering costs. But is only a step and there is so much more you can do. As the owner and manager of the business your focus is understandable, maximise the profit. To do this you may choose to increase prices but in a competitive market this move can be risky and may reduce sales volume. Competitors are by definition competing for the same business you are chasing. Some competitors will be the slick and highly productive operators that have a natural advantage of being the lowest cost manufacturer. This advantage means they can either make more profit than you or offer lower selling prices to win the business, while maintaining a healthy margin. They therefore control the market. We all know that unless you have a strategic advantage that is particularly attractive to the prospect, your selling price will need to be competitive. This makes the selling price inflexible in most cases. This fact alone makes it clear that your best option to achieve higher profitability is not to increase prices but instead to reduce costs and become a low cost manufacturer. The thing is, it is easier to reduce costs than you think. All you need to do is introduce automated processes to the running of your business and get rid of the old time-consuming methods. FACT: It is important at this point to explain that many well accepted mainstream software producers in this industry have programs that use up massive amounts of user time unnecessarily. Operators are wasting hours and hours drawing and customising cabinets when it can be done in minutes with the right software. If you do not understand this please ask for a demonstration of QuickCAM to see for yourself. We can show you how to get 5 times more out of your factory with no additional people. The CNC machine only contributes a small part of the potential cost savings available to your company of your production system and there are many other things to consider. What about all the other areas where you can save time? How much time do you spend finding new customers? How long do you spend designing a kitchen or bathroom? What is your success rate? How many jobs do you win? How quickly can you provide a quotation? How fast can you make complex product customisations and how long does it take to get those changes to the machine? How much time do you spend performing all those jobs that could be automated? Your ongoing battle against larger and better equipped competitors is huge and can be very time consuming as the bigger companies apply an ever growing level of technology and automation, which continues to reduce their costs. For over 20 years QuickCAM has been developing software that not only controls the CNC’s every move but also provides solutions for the other activities before and after the CNC involvement in the project. This means that QuickCAM Systems can automate not only the CNC functions but all other vital functions such as project design and visual imagery, product customisation, costing, quoting and many other vital operational necessities. In short, QuickCAM software can deliver a faster more automated manufacturing system requiring less man-power than any other in the industry. QuickCAM Systems, who are responsible for some of the most cost reducing developments available to high volume kitchen manufacturers have now released a new range of highly effective, automation intense software solutions for the medium manufacturer with a CNC, in a way that will certainly not break the bank. The various options are individual and are available in a package that will meet with your business plan and your budget requirements, either as an outright purchase or by a very affordable subscription, so ask us how we can make this work for your business.